Physical-chemical or biological processes can be used to remove the ammonium present in water. As previously reviewed (see section the oxidants and disinfectants), ammonia removal via reaction with chlorine is possible when the amount of chlorine dosed rises above the critical point. However, disinfection by-products (organo-chlorines, THM etc.) often appear under these conditions and their presence is unwanted (see section pollution generated by water treatment). Therefore, this technique only applies when the water contains lowamounts of precursors. ie. at the end of a treatment train, on clarified and polished water. This applies in particular when making up the shortfall in biological treatment used to remove ammonia (cold water seasons, for instance). 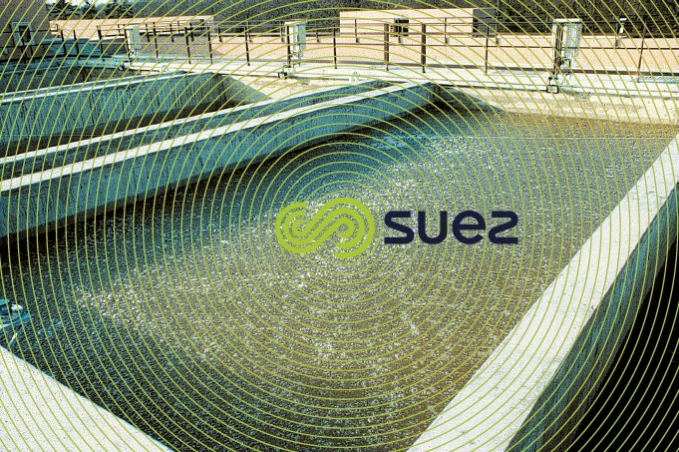 Accordingly, the Morsang-sur-Seine (France) plant (figure 9 in polishing: removal of organic matter and micro-pollutants) is equipped with a plug-flow,polished water tank at the end of the line. The other oxidants (ozone, CℓO2, chloramines, KMnO4) are ineffective for removing ammonia. Ion exchange: clinoptilolite (natural zeolith) has occasionally been suggested for removing NH4 but is expensive to use. Please refer to section nitrogen cycle, suspended growth (activated sludge) process and nitrogen conversion for the conditions applicable to the development of bacteria responsible for biologically oxidising ammonia to nitrite and then to nitrate. As NH4 levels in raw water are quite low, in principle, nitrification during drinking water production takes place through filters (attached growth) that are either dedicated by selecting granular media (biolite) that encourages bacterial attachment, or through sand and/or GAC filters that may be required for treatment on other grounds. a sufficiently high temperature: below 8 to 10°C, bacterial metabolism declines rapidly and ammonia oxidation slows considerably (and produces nitrites) or may even be totally inhibited below 4 to 5°C. total absence of any residual disinfectant. Additionally, one needs to allow for a 1 to 3 months natural seeding period to ensure that the process becomes fully effective. Utilisation techniques differ mainly through the support medium used for bacterial attachment, the flow direction of the water to be treated and the presence or absence of air that is continuously injected into the nitrification reactor. It should be noted that in drinking water treatment, reasoning tends to be based on the ammonium ion NH4+ and not, as in the case of wastewater, on N-NH4+ = nitrogen in the ammonium. every 2-3 years, this material has to be removed from the filters and replaced. Therefore, this technique was dropped and superceded by the Nitrazur N.
In section nitrogen conversion the effect of temperature on nitrification kinetics was reviewed and this aspect was reminded. filtration through GAC (Biflux filters). co-current reactors where both water and air flow from the bottom upwards (e.g. the Okhla plant in India). These reactors operate at a velocity of approximately 10 to 15 m · h–1 and use a 0.3 to 1 air/water volume ratio. The choice of one or other type will be guided by the amounts of NH4+ that has to be nitrified and, therefore, the oxygen requirements; in effect, an air flow rate that is high compared to the water flow rate can create binding phenomena in a downflow reactor; on the other hand, with an up-flow (co-current) reactor, additional filtration will be required because low turbidity levels cannot be guaranteed with this type of reactor. The Filtrazur (see section filtrazur filters) is an attractive alternative to the foregoing nitrification reactors. Use of a material that is lighter than water also allows filtration to take place from the bottom upwards and, if necessary, for air to flow upwards. In fact, non-aerated Filtrazur are used with 1 to 1.5 mg · L–1 concentrations of NH4+ (Aubergenville) and aerated versions for higher concentrations (Jang-Xou, China). When these three elements are present, the treatment sequence in the stability diagram can be seen in figure 37. It follows that iron can be eliminated biologically without nitrification, but not manganese. 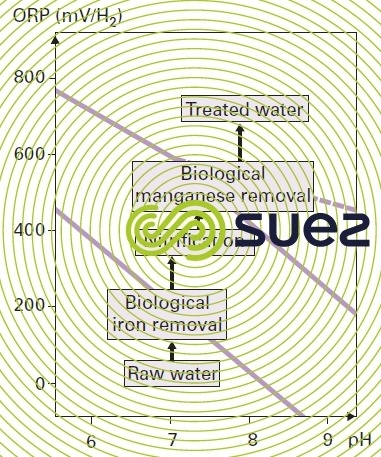 Additionally, the operating conditions applicable to biological iron removal (high velocity, short contact time, dissolved O2 limitations) will be in opposition to those required for nitrification; therefore, biological iron removal will often have to be carried out at a later stage, calculated on the basis of the NH4+ that has to be removed and on the temperature of the water; biological manganese removal can then be carried out in the same reactor provided nitrification is complete before the treated water is discharged. polishing filtration where nitrification and manganese removal will be completed simultaneously using the biological process. 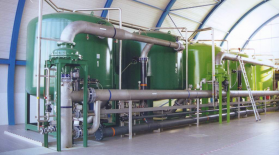 Note: for surface waters containing suspended solids where drinking water production demands a comprehensive clarification treatment including polishing, nitrification will be seen to occur during several of the stages applied. E.g. raw water storage, clarifier sludge beds, sand filters, GAC filters.